So, I assume that any career spacers would need robot eyes pretty soon. 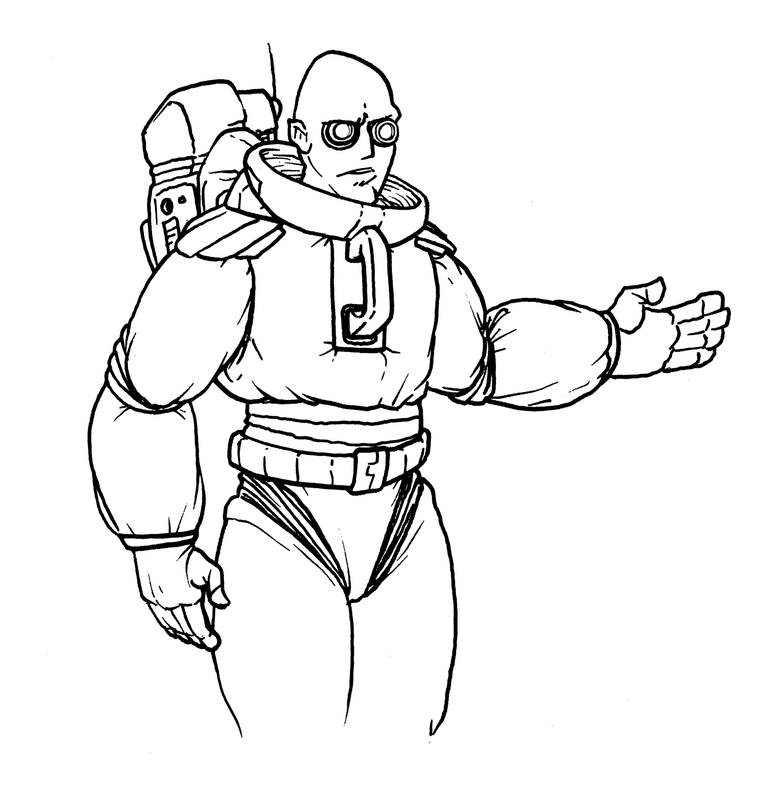 I sketched this guy out this morning, inspired by the need for my space-suited characters to have mechanical lenses instead of stupid, squishable, meat balls for seeing all the awesome stuff out there in the cosmos. Also, it seemed right to give him a little cone head too. Still loving the pillowy, fluffed-ot space suits for now. If you think you may have seen this one before, you could be right. One of my favorite things to do when I just want to warm up in the morning is to throw some vellum over and old sketch and try and cleanly work some lines with technical pens. The sketch was done years ago, but I felt it had more to offer. 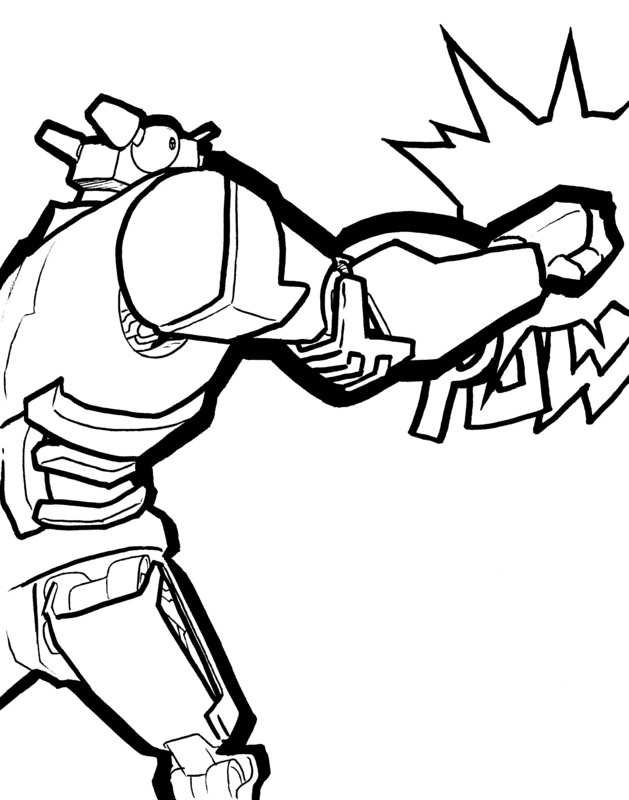 So, I inked this on the bus… or maybe it was the train… definitely NOT the plane, though. I hate flying so much. Who likes sketches? Here’s a look inside my compact, little sketchbook I carry around with me. 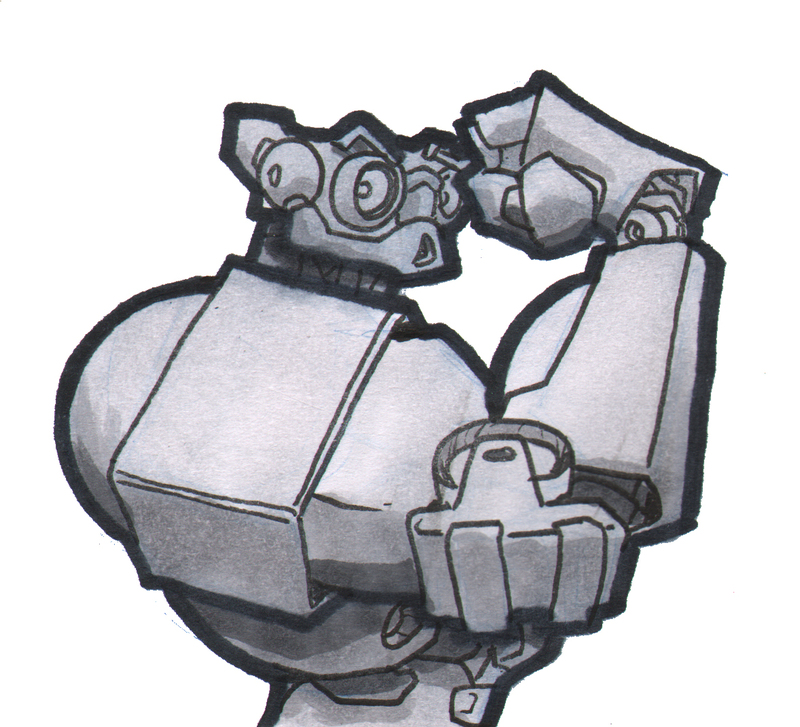 They’re supposed to be an artillery gun needed for the story in Father Robot issue #3. At first I was going for a spidery-looking vehicle that could kind of crawl around the hillsides, firing on our intrepid hero. 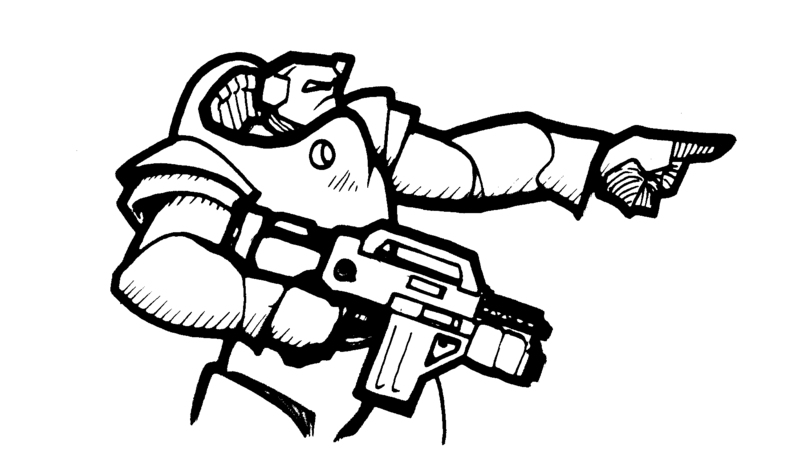 It occurred to me that not only was that going to be a real headache to draw with the story needs, but that such a design would not be practical for a powerful gun. This sketch is very close to what I actually ended up using. In fact, I took the concept phase no further once I had these sketches on the page. 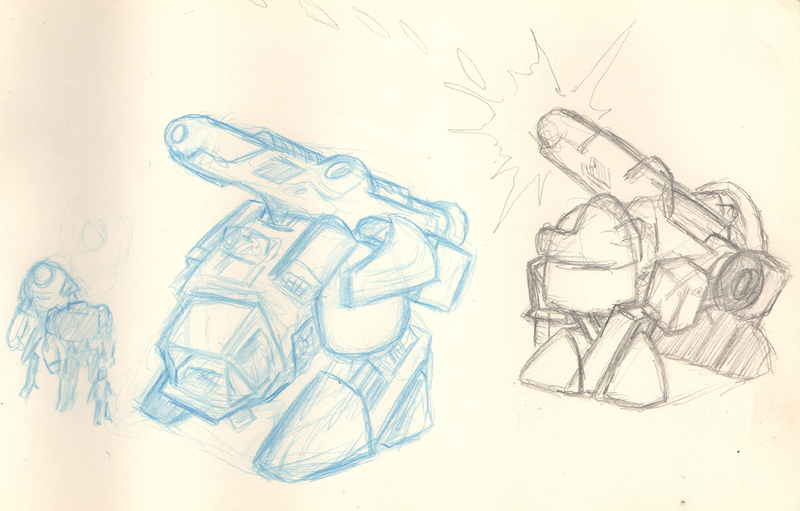 It looks like it might be able to walk (or at least waddle) around, but could keep its footing when that powerful canon is fired. 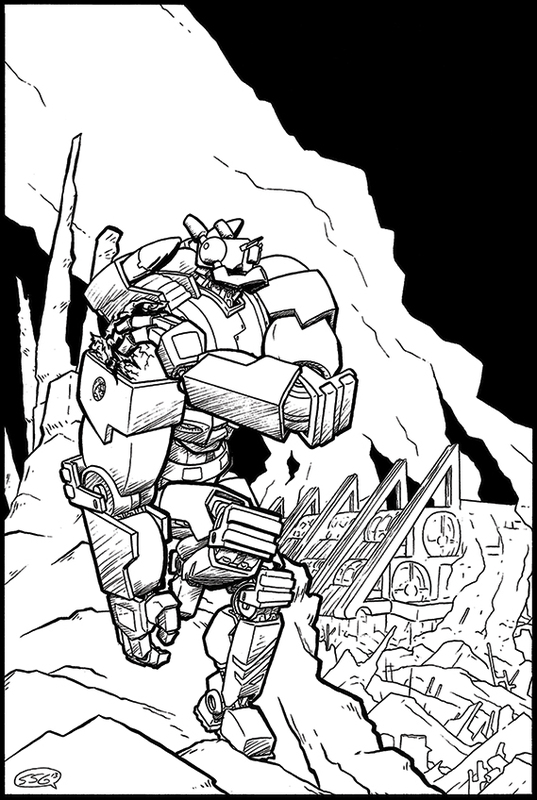 If you look closely you can see FR, a lil’ person, and a Southern Forces robot standing off to the side for scale. A human should be able to climb up and stand in that glass canopy in the front. Today saw another great day at Alternative Press Expo. Thanks to everyone who came by the table. I had a fantastic time meeting new folks and reuniting with fans. I hope everyone got as much cools stuff as I did (my favorite is the evil, stuffed bunny I got my girlfriend… yes, its face comes off) and are reading some great new comics. 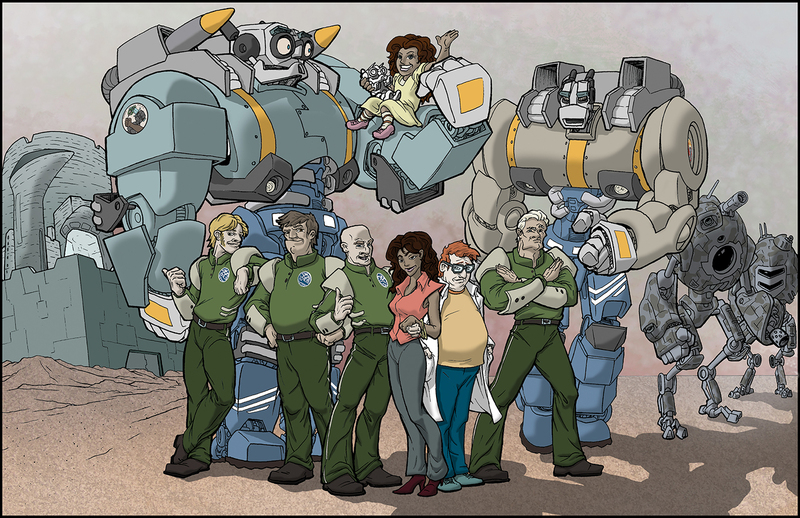 As another great year at APE ends, I thought everyone might like to enjoy this updated group shot of all the Father Robot character from issue 1. Which is awesome, because usually when I do commissions I never see them again. So yay! Thanks, Tom, for the commission, letting me part of your incredible project, and for posting these drawings. I learned a lot from my interactions with comics fans, publishers, distributors, writers, and other illustrators this past weekend. Most importantly, I learned more about what I need to do next to accomplish my career goals in comics. I think fast, efficient work is going to be very important for me in the very near future. In the spirit of such things, here’s a sketch I did fast and furiously while at the table, using the broad side tip of a Copic marker. Normally I try to charge for sketches at con tables. I do this because, in the past, I’ve found that if I open it to the concept of free sketches I quickly find myself drawing all day to the neglect of my table. I set out to charge at Comicon this year, but I discovered that with Kristopher doing all the work bringing people over to the table and talking about the books, I had time to draw and draw and draw. And so, I did quite a few sketches for people who asked, and quite a few for myself. 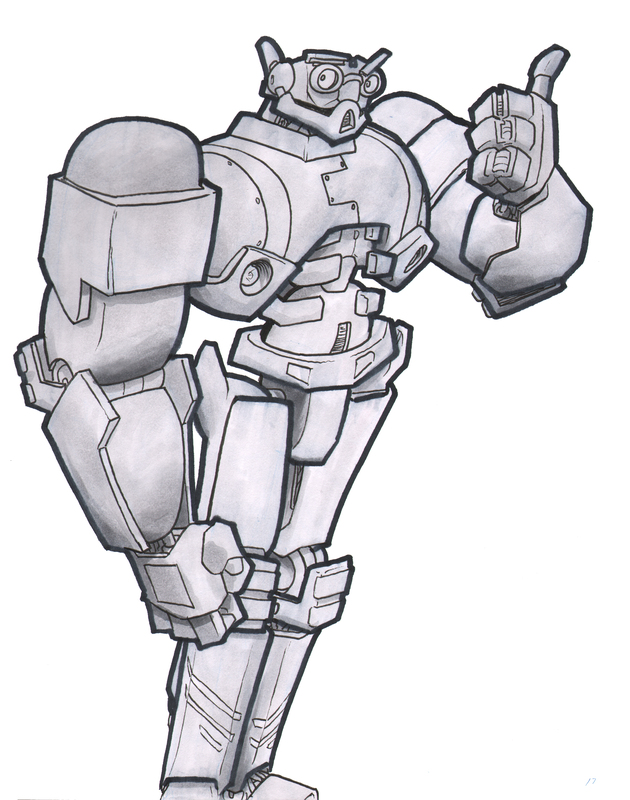 Here’s one, done at the table with Copic markers. I just flew back from San Diego, and, boy, are my arms tired. Ha. Ha. It was a great week, but I am exhausted. 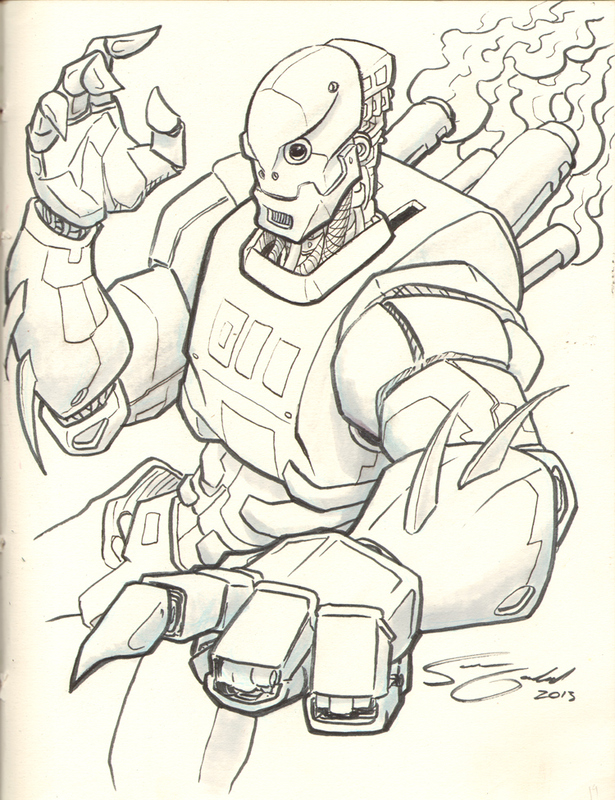 More about what all went down later, but for now, check out this sketch I did at the table. If you’re like me, you show up at comic conventions hoping to find a certain kind of collectible/memento. Convention exclusives are a standard, and personally, I think there’s nothing more exciting than some original art… and nothing more expensive. That’s why I think so many artists do exclusive prints. I bought one a few years back of Terry Dodson’s take on an Emerald City Con poster. It’s amazing! And so, I thought in honor of my first real appearance (those times hovering around other people’s tables with Figments off to one side don’t count) at Comicon as an exhibitor, I’ve created a little exclusive treat for anyone interested in picking up my version of such things. What you see here is the line work for the Father Robot Comicon 2013 exclusive. If you’re going to be at the convention in San Diego this week, please come by the table and check out the full-size, colored print of this one, as well as all the other awesomeness. As the big convention in San Diego gets closer, I seem to be spending less and less time at the drawing table. Not to worry, though! There’s more developments on the horizon. 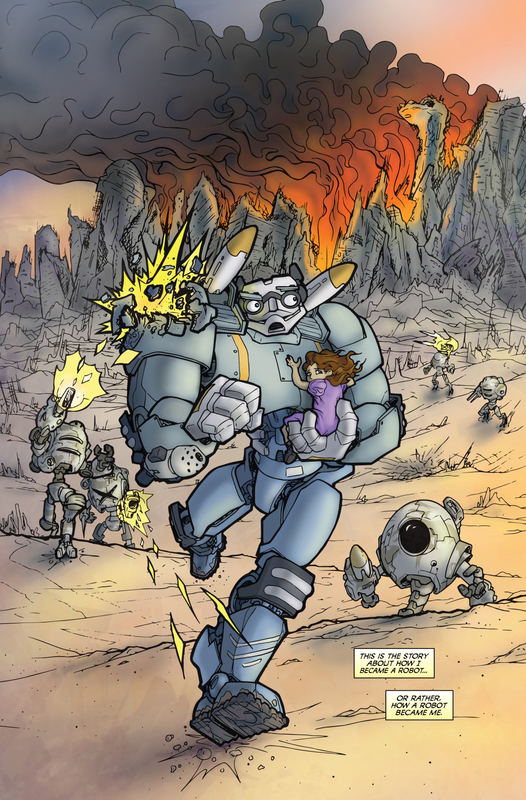 For now, I hope everyone who can will come check out the Father Robot awesomeness at table L-06 in the Small Press Pavilion next week. More pages will post at fatherrobot.com in the days leading up to Comicon.